Cochineal Dye > What is Cochineal > Cochineal insects - cochineal bugs or beetles? 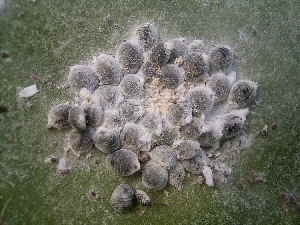 Cochineal bugs or cochineal beetles? Cochineal insects are scale insects, that is, they are small plant-sucking bugs that are fairly closely related to aphids or cicadas (they are all homoptera), and not at all related to beetles. The term cochineal beetle is a complete misnomer. There are over 20 families of scale insects containing nearly 8000 species and in most of them, the female is sessile, remaining permanently attached in one place on its host plant for the whole of its life and covered by a protective waxy covering that it secretes. The cochineal insect was originally described by Linnaeus in 1758 as Coccus cacti but it appears that the insect that Linnaeus was sent was not a nopal cactus cochineal. Burmeister and Costa separately described the correct scale insect and, as Costa described it first, it is Costa’s name Dactylopius coccus that is the correct name for true nopal cochineal insects. There are around 10 species or types of Dactylopius, all in the small family Dactylopiidae, all feeding on various species of Opuntia cactus and all of which may produce cochineal dye. They are very difficult to distinguish and hence Dactylopius coccus in research papers may actually refer to any one of them although D. coccus appears to be the most important economically. Coccus cacti is now known to be an unrelated scale insect of the separate, large family Margarodidae, which does not produce cochineal dye and which is not a synonym of Dactylopius coccus.